Take A Listen To The Shots Podcast : Shots - Health News Are you prepared for some unorthodox audio from an ink-stained wretch still working on the transition to online journalism from print? If so, click through to listen to Shots, the podcast. This episode covers multivitamins and cancer, health report cards and how Americans feel about retail health clinics. 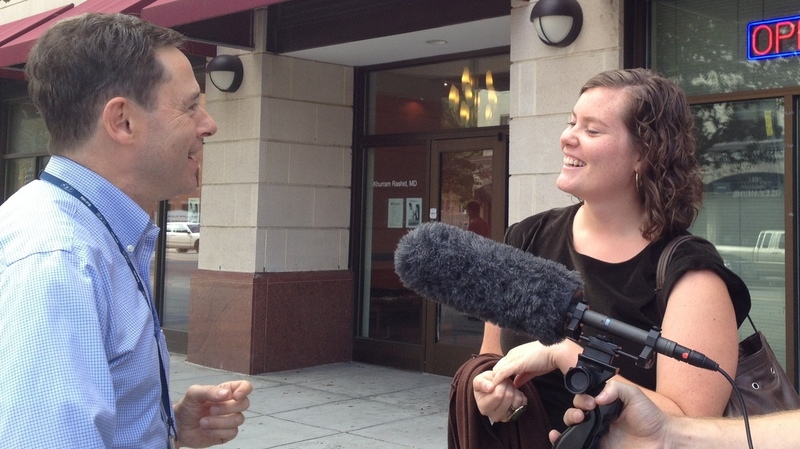 In Washington's Columbia Heights neighborhood, Claire Robertson, a grad student, talks with Scott Hensley about retail health clinics. We're always looking for new angles on health news. And now we're trying a new angle on Shots: a podcast. This is an experiment, so I should ask for your informed consent. Are you prepared for some unorthodox audio from an ink-stained wretch still working on the transition to online journalism from print? If so, click away. The podcast starts with a segment about retail health clinics. I preview the results from the latest NPR-Truven Health Analytics Health Poll on the subject with the help of some friendly people who stopped to chat in Washington's Columbia Heights neighborhood. After that, I check in with Steven Salzberg, a bioinformatics guru at Johns Hopkins, about a recent study that found a daily multivitamin appeared to slightly reduce the risk of cancer in men 50 and older. Salzberg, who writes the Fighting Pseudoscience blog at Forbes, is skeptical. Recently, I wrote about another study that found some unintended consequences from public ratings for doctors. It turns out that doctors in states that require quality reports about the use of angioplasty to treat patients having heart attacks use the procedure less often than cardiologists in states without those reports. Harvard's Dr. Ashish Jha, a health policy researcher, explains why that could be a problem. Finally, NPR's Julie Rovner and I talked about her reporting on how consumers use quality ratings for hospitals. And she explores whether Gov. Mitt Romney would be able to follow through on his promise to undo the federal health law if he becomes president. Some thanks are due. Travis Larchuk produced the podcast. David Schultz pitched in, too. The multitalented Adam Cole whipped up the theme music. And Eliza Barclay helped make it all possible by running Shots last week. If you have feedback on the podcast, leave a comment or send a response with our contact form. Thanks for listening!